For the longest time, Florida State’s offensive line depth has been very thin. Even in 2013, when the Seminoles won the national championship, they were one injury away from having guys like Jacob Fahrenkrug and Sterling Lovelady play along the offensive line. Raise your hand if you actually remembered that those guys were on the team. Fortunately, Jimbo Fisher and Rick Trickett have recognized that depth on the offensive line has been a serious problem. Florida State has been one of the best teams in the country at recruiting offensive linemen, most notably with their most recent class which included six offensive linemen. Their recruiting efforts in the past couple of cycles have paid off and Florida State currently has 19 scholarship players on the offensive line. That’s nearly enough for a four-deep at every position! There is certainly optimism that Florida State’s offensive line could take a step forward in 2016. Last year, the Seminoles’ offensive line was one of the weaker units on the team. Out of the five positions on the offensive line, only two players were starters for all 13 games. Center, left guard, and right tackle all had multiple starters throughout the year. As such, Florida State’s offensive line struggled. Due to injuries, they were forced to play linemen that were perhaps too raw for major snaps and did not adequately protect the quarterback and open holes for the ground game. Luckily, a certain Heisman-caliber running back was able to thrive despite these issues and he helped mask a lot of issues on the line. But now, Rick Trickett’s unit returns nearly every player from last year. The only exception is senior Chad Mavety, who has been dealing with a cardiac issue and is no longer listed on the official roster. Despite the loss of Mavety, Florida State’s offensive line could take a major step forward in 2016. Because offensive linemen do not record any stats, one of the best ways to evaluate the state off a team’s offensive line is to count the number of starts that they have along the line. Entering the 2015 season, Florida State returned 9 starts along the offensive line. This was due to graduating four senior starters and the Seminoles had perhaps the most inexperienced offensive line in the entire country. On the flip side, the situation this year is much better. Entering the 2016 season, Florida State returns 65 starts along the offensive line. While some ACC teams such as North Carolina and Pittsburgh have nearly 100 returned starts, Florida State is back in the middle of the pack which is a much better situation than they entered with last year. The player with the most career starts along the line is left tackle Roderick Johnson (77). The 6-7, 311-pounder stepped in for FSU as a true freshman and has developed into one of the best offensive linemen in the country. Several national services have him as a preseason All-American and his name is already circulating among NFL Draft circles. Johnson was very good for a true freshman, but struggled a bit as a sophomore. He faced some of the best pass rushers in the country, including Louisville’s Devonte Field and Clemson’s Shaq Lawson, and held his own. Johnson is very technically sound and should continue to develop throughout his junior year. If Johnson has a good junior year, there is a real possibility that he could make the jump to the NFL and be an early draft pick. Big Rod’s backup at left tackle will likely be sophomore Ethan Frith (62). While he was only a three-star recruit, Frith has the size at 6-7, 316-pounds that the coaching staff looks for in offensive tackles. Competing with Frith will be Abdul Bello (75), a redshirt freshman who sat out last year because of injury. Bello came to Florida State as a blue-chip recruit, but is still fairly new to the game of football, so it is unlikely that he will see major snaps this year. The only senior starter along the offensive line will be Kareem Are (72) at left guard. At 6-6, 325-pounds, he and Johnson form a very big duo along the left side of the line. While Are started and finished the year as the starter at left guard, there was a period of five games in the middle of the season where he was injured and sat out. Assuming that he is healthy, Are is perhaps Florida State’s second best offensive lineman behind Johnson. He is a great run blocker and should continue to develop as a pass rusher. Backing up Are this year will likely be David Robbins (52). A three-star recruit out of high school, Robbins showed flashes of promise in the spring game and held his own against the talented defensive linemen on Florida State’s roster. With Are set to graduate after the 2016 season, Robbins could be the starter at left guard as a redshirt sophomore in 2017. For the first half of the year, the center position was a mess. It wasn’t until Alec Eberle (54) took over that it finally had some stability. As a redshirt freshman, Eberle stepped in and provided a reliable option at the position. Now a redshirt sophomore, the 6-4, 296-pounder is one the clear starters along the offensive line. This year, he should be entrusted with more responsibilities and has already been named to the 2016 Rimington Award trophy watch list, awarded annually to the nation’s best center. 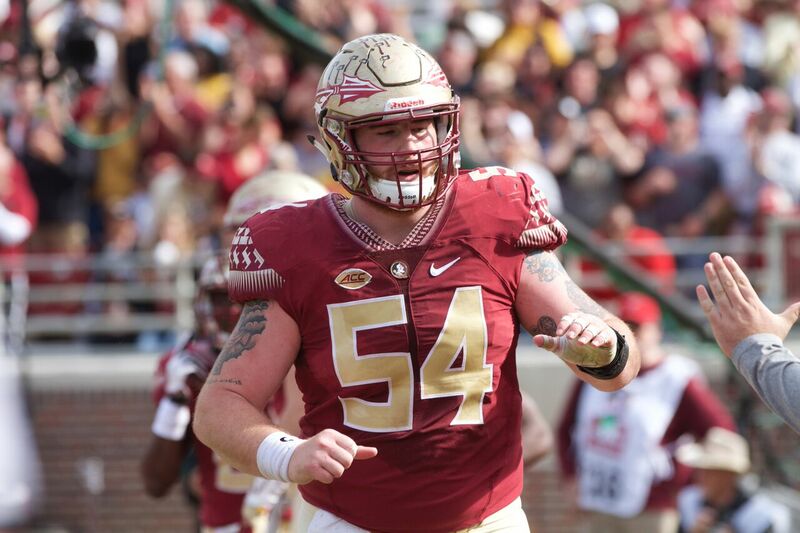 Florida State has a plethora of options behind Eberle at center. The first is Corey Martinez (57), a fellow redshirt sophomore who actually began the 2015 season as the starter at center before being benched. Martinez occasionally takes first team reps with the first-team unit in practice and is a reliable backup. The other name is Ryan Hoefeld (59), a player who has started games as both a redshirt freshman and sophomore at times. Finally, Florida State has a very talented true freshman center in Baveon Johnson (51), but it is likely that he will redshirt this season baring injuries to the position. The right side of the line is where things start to get interesting. Redshirt junior Wilson Bell (78) started every game last year at right guard, but his play left a lot to be desired. Bell struggled with false starts, run blocking and dealing with better defensive tackles. Still, in a year where injuries ravaged the line, Bell was a nice consistent piece to have at right guard. This offseason, there have been several players competing with Bell for the job at right guard. First and foremost is redshirt freshman Cole Minshew (70). Minshew was only a three-star recruit coming out of high school, but many thought he could actually take major snaps last year as a true freshman due to his immense size (6-5, 338-pounds), strength and raw talent. Unfortunately, Minshew dealt with concussions last year and took a redshirt season. This year, hopes were high that Minshew could step up and earn a starting job along the line. However, he has sat out for a couple of practices in a row with concussion-like symptoms and it looks as if the coaching staff will take it slow with him. Concussions are a serious problem in football and this coaching staff will know when Minshew is ready to play again. Redshirt sophomore Derrick Kelly (74) is a player who started a couple of games last year at right tackle, but has also competed for the right guard job in fall camp. He played at a fairly good level last year as a starter before injuries forced him to sit out for the rest of the season. At 6-5, 323-pounds, Kelly has the size that the coaching staff is looking for in their interior lineman and has shown that he is capable of playing at an ACC-level. Kelly would not be a massive upgrade over Bell, but it is nice to know that there is some competition for the job. The final, and most interesting, name competing for the right guard job is true freshman Landon Dickerson (69). A five-star recruit out of high school, Dickerson showed up to fall camp in incredible shape. He is listed at 6-5, 310-pounds and has a nice skill set to work with. He was recruited as a tackle, but projects to play guard in college. Much like some other true freshman that have enrolled at Florida State, Dickerson might be too talented to sit on the bench. While he might not start from day one, there is a good chance that Dickerson works himself into the starting lineup at some point this season. Last year, the right tackle position was a literal revolving door. Then-redshirt freshman Brock Ruble (78) started the first three games before being benched for Derrick Kelly. After four more games, Kelly was injured and Ruble took over again. For the final three games of the regular season, Chad Mavety started. Finally, Ruble was once again forced into the starting lineup for the bowl game versus Houston. In all, Florida State had four players start multiple games at the right tackle position. Sensing that something needed to be done, the coaching staff moved junior Rick Leonard (76) from defensive end to offensive tackle. Leonard had been a backup at end for his first two years on campus and it seemed as if Rick Trickett was intrigued with his athleticism. Listed at 6-7, 306-pounds, Leonard certainly has the size that the coaching staff is looking for in their tackles and clearly has the power and athleticism to play the position. The question with Leonard is experience and technique. Trickett certainly was not going to hand Leonard the job at right tackle immediately upon switching positions, but Leonard showed in the spring game that he has taken to the position with gusto. He played very well at right tackle in the spring game and even shut down Josh Sweat on occasion. It looks as if Leonard is in line to start at right tackle to begin the season. While he doesn’t have experience at the position and might be beaten once or twice by more experienced pass rushers, the coaching staff is banking on his natural athleticism to hold over until he takes more and more snaps. With Leonard as the starter, Ruble will most likely be his primary backup. Ruble, listed at 6-8, 319-pounds, showed last year that he still might be one or two years away from taking major snaps. Other than the names listed above, Florida State has a plethora of true freshman that will likely redshirt this season. Josh Ball (79) has great size at 6-8, 287-pounds and will likely be an offensive tackle during college. Juaun Williams (73) impressed the national audience with his athleticism on live television and could be either a tackle or guard. Finally, both Andrew Boselli (60), the son of Jaguars great Tony Boselli, and Mike Arnold (65) both project to play either guard or center in college. For the first time in forever, Florida State has great depth along the offensive line. Rod Johnson, Kareem Are and Alec Eberle are cemented into their starting job and good competition is happening at the right guard and right tackle positions for the remaining two jobs. There is a good chance that Florida State’s offensive line could take a momentous leap forward in 2016 and be one of the best offensive lines in the nation.